Life can be unfair. Illnesses and storms strike with cruel indifference. Humans do horrible things to one another. 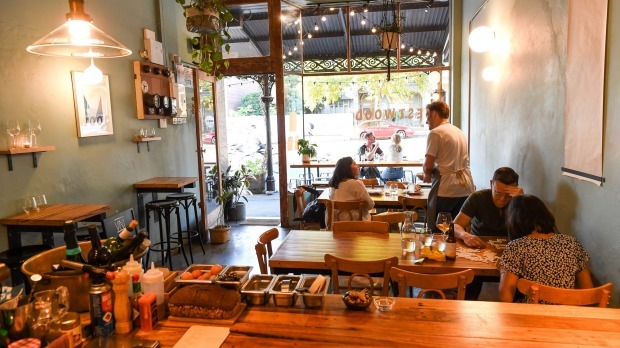 Outside Westwood, the tiny cafe and wine bar in West Melbourne that used to be Clever Polly, sits a customer's greyhound with 45,000 more followers than the switched-on venue, simply by virtue of having an overbite and very fancy socks. It's no huge injustice. Salty (@thesaltyhound,​ FYI) is attention-worthy. But so is chef Rhys Bennett's casual-contempo Brit-ish menu, and it has flown under the radar since October. Michael and Monica Underwood opened Westwood last July, splashing the slim room in duck-egg blue, adding copper bowls and pot plants and a distressed metal kitchen backdrop to the snug space. Those first months, MasterChef finalist Lynton Tapp was on the pans, sending out dishes like stracciatella and broccolini – stuff you'd see at most wine bars. Bennett came fresh from the uncompromisingly rigorous kitchens of Dinner by Heston Blumenthal, where he learned military precision yet copped a regular bollocking for attempts to do his own thing. That thing, it turns out, is smuggling great ideas out of Britain's pubs and parlours and plating them up alongside small-producer wines from Europe and Oz like a tiny, tasty anti-Brexit protest that won't make you want to poke out your eye. 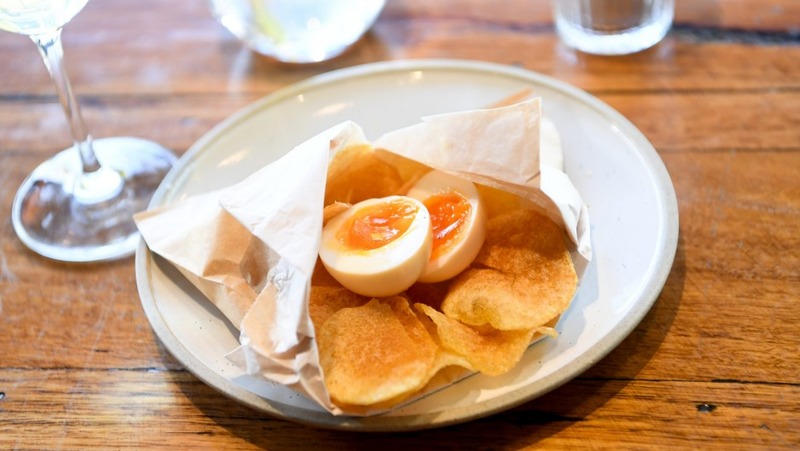 Then again, maybe a still-warm bag of house-made crisps tasting of real potato, served with a couple of fudgy-yolked pickled eggs for a salt, vinegar and fat party is a reminder that the UK isn't a culinary wasteland? Not after its proud history of plundering the world at any rate. See here the pure genius of taking kedgeree – an Anglo-Indian curried rice and lightly smoked fish dish – and using it as the casing for a scotch egg in place of heavy sausage mince. With a tangy shallot-stuffed dressing, it makes your ideas of Britain great again. It's a heavily snack-driven menu, backed by a few self-contained mains (Tuesday is $25 pasta and wine night, and a big local draw), and by day, sandwiches and breakfasts like kippers and eggs. It does not sound like a light, breezy time. We're talking black pudding with fried egg, steak tartare (obviously) and devilled duck hearts. But Bennett has a light touch, and dishes land with polish. 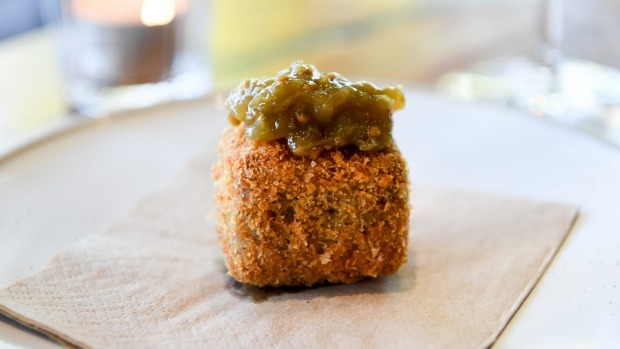 Fried terrine is a perfect golden breaded puck, all sticky with luxurious shredded pork cheek inside and crowned with elegant green tomato relish. 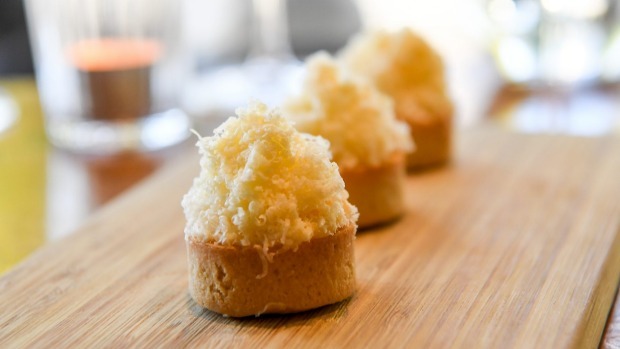 Cheese and pickle tartlets have perfectly short pastry cases, layered with a mustardy onion chutney, cheddar custard (a little fridgy in flavour one night) and a snowdrift of the sharp cheese. Bennett has a thing for pickles, but also smoke. If you enjoy the sometimes extreme peaty signature created by cold-smoking produce (I don't) then there is "lamb ham", shoulder-turned-terrine that's finely sliced, smoky as Islay whisky and pulled back into focus by an excellent piccalilli. Bright pickled carrots with a silky, smoky fennel-dusted roast carrot hummus is like a gussied-up American barbecue side. This isn't a big R restaurant. Westwood is every bit a little local bar, which is its superpower, but has caveats. Some tables are comically tiny squares with stools, others are communals to be shared. Some weeknights it's just one chef on the pans, and Michael Underwood tending to all needs on the floor. Bottlenecks can happen. On bottles, the blackboard wine list is a quirky yet concise dozen (maximum $68 a bottle) including a grippy Rapatel from French naturalist Gerard Eyraud, a bright Aussie-grown version of Basque txakoli and Deano's pinot noir from the Yarra Valley. Wine advice? It's more there for the asking than part of the service. Far more impressive things are happening than you'd expect from a drive-by. The salmon is wildly tender, having been brined then cooked sous-vide so it's just set. This gets crunched up by toasty puffed rice, and yellow dhal made brilliantly vibrant with kaffir lime and coconut. Crisp toasted buckwheat makes a dark and malty Mediterranean "salad" with spicy roasted peppers, onions and charred zucchini for the eternal winter to come. 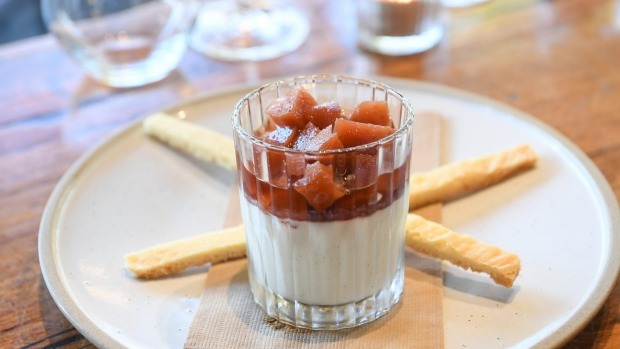 Buttermilk pudding is pure practiced technique – like a tart, ultra delicate panna cotta that resigns at the least push (insert your Theresa May jokes here), comes with fudgy quince that's seen half the spice cabinet and physics-defying shortbread the length of grissini. Should the empire crumble in coming years, at least this envoy escaped to remind our citizens and salty hounds of the UK's smarter moments. Vegetarian A few snacks and bulky sides, but it's quite meaty. Drinks Curious wines, spirits and beers (sadly, no dark brews, more pale ales and sours). Cost A $50 feed-me menu, small plates $6-$18, mains $25-$32. Pro Tip: Tuesdays are $25 pasta and wine night. Go-to Dish: Fried pork terrine with green tomato ($6).